Turns out, Tiger Woods wouldn’t really rather have a Buick. At least not anymore. When Woods ended his nine-year relationship with General Motors Corp. on Monday — a mutual decision between a megawatt celebrity who doesn’t need the work and a teetering corporation that needs every penny — it offered yet another snapshot of how badly the American economy has deteriorated. 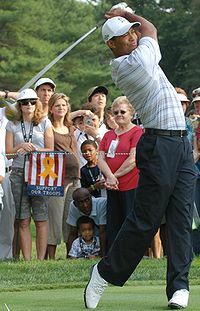 Woods is the world’s most marketable athlete with an estimated $100 million endorsements a year. If his agreement with one of the world’s most active sports sponsors dissolved, some experts wonder if any endorsement or sponsorship deal is really ironclad in these tough times. “Nothing,” said a General Motors spokesman last week, “has changed relative to the GM board’s support for the GM management team during this historically difficult economic period for the U.S. auto industry.” Nothing? Not even the evaporation of almost all shareholder value? GM’s statement comes as the mendicant company is threatening to collapse and make a mess unless Washington, which has already voted $25 billion for GM, Ford and Chrysler, provides up to $50 billion more — the last subsidy until the next one. The statement uses the 11 words after “team” to suggest that the company’s parlous condition has been caused by events since mid-September. That is as ludicrous as the mantra that GM is “too big to fail.” It has failed; the question is what to do about that. The answer? Do nothing that will delay bankrupt companies from filing for bankruptcy protection…. The Big Three U.S. automakers need more than an injection of $25 billion from the federal government. Because of their ongoing losses, they would burn through that money in less than a year and would soon be back for more. General Motors, Ford and Chrysler can make excellent cars, but they cannot sell them at prices that are competitive with the prices of cars produced in the United States by Toyota and others or with the prices of cars imported from Europe and Asia. The basic reason is the labor costs imposed by union contracts. The Big Three pay much higher wages than production workers are paid in the nonunion auto firms and in the general economy. And the health-care costs of current workers and retired union members are an enormous additional burden. The simplest solution is to allow GM and the others to file for bankruptcy. If the companies file under Chapter 11, they would be able to continue producing cars, and the workforce would remain employed while the firms reorganized. The firms would also be able to get short-term credit under bankruptcy protection. The bankruptcy court could require the unions to rewrite contracts, bringing wages down to levels that would allow the firms to compete and therefore to maintain employment. Scaling back employee and retiree health benefits would further improve price competitiveness and allow better cash wages. The firms’ bondholders and other creditors would have to take losses. Shareholders’ fate would depend on how firms responded to this restructuring. Top Republican senators said Sunday they will oppose a Democratic plan to bail out Detroit automakers, calling the U.S. industry a “dinosaur” whose “day of reckoning” is coming. Their opposition raises serious doubts about whether the plan will pass in this week’s postelection session. Democratic leaders want to use $25 billion of the $700 billion financial industry bailout to help General Motors Corp., Ford Motor Co. and Chrysler LLC. Sens. Richard Shelby of Alabama and Jon Kyl of Arizona said it would be a mistake to use any of the Wall Street rescue money to prop up the automakers. They said an auto bailout would only postpone the industry’s demise. “Companies fail every day and others take their place. I think this is a road we should not go down,” said Shelby, the senior Republican on the Senate Banking, Housing and Urban Affairs Committee. House Speaker Nancy Pelosi, D-Calif., said over the weekend that the House would provide aid to the ailing industry, though she did not put a price on her plan. If General Motors really does run out of money by the end of the year, as it predicted was possible, the impact would be felt far and wide – to hundreds of suppliers, rival automakers and ultimately dealers across the nation. “Once the first domino falls, it rapidly takes out all the other dominoes,” said Dennis Virag, president of the Automotive Consulting Group. Suppliers would be among the first to feel those effects since GM only manufactures the body, the engine and the transmission used in its cars. In the United States alone, GM spends $31 billion on parts from 2,100 different suppliers. These include the “direct suppliers” involved in producing a vehicle – those that provide everything from steering wheels and seatbelts to brakes and airbags – as well as “indirect suppliers” – those that make things such as gloves, protective eyewear, shop rags and lightbulbs. A senior Democratic senator raised doubts on Thursday that an attempt to bail out U.S. automakers had enough support to clear Congress this year. As Republicans amplified their concerns about a bailout, Senate Banking Committee Chairman Christopher Dodd raised the biggest red flag for fellow Democrats trying to craft a $25 billion rescue and pass it during a post-election session set to start next week. “Right now, I don’t think there are the votes,” Dodd of Connecticut told reporters about prospects in the Senate. “I want to be careful of bringing up a proposition that might fail,” he said. Although Dodd said “we ought to do something” and personally backed using money from the ongoing $700 billion financial services rescue program to help Detroit, he was skeptical that enough Republicans would support a bailout. Senate Majority Leader Harry Reid, a Nevada Democrat, also cautioned that success of a bailout rests with Senate Republicans and the White House. With their slim majority, Democrats cannot force a measure through the Senate or trump a White House veto. The White House opposes the approach being taken by congressional Democrats but has not threatened to block any bailout. Bush administration officials have said they would consider other steps Congress can take to help General Motors Corp, Ford Motor Co and Chrysler LLC. Dodd said there have been “legitimate issues raised” about how to help. The prospects of a government rescue for the foundering American automakers dwindled Thursday as Democratic Congressional leaders conceded that they would face potentially insurmountable Republican opposition during a lame-duck session next week. At the same time, hope among many Democrats on Capitol Hill for an aggressive economic stimulus measure all but evaporated. Democratic leaders have been calling for a package that would include help for the auto companies as well as new spending on public works projects, an extension of jobless benefits, increased food stamps and aid to states for rising Medicaid expenses. But while Democrats said the stimulus measure would wait until President-elect Barack Obama takes office in January, some industry experts fear that one of the Big Three automakers will collapse before then, with potentially devastating consequences. Despite hardening opposition at the White House and among Republicans on Capitol Hill, the Democrats said they would press ahead with efforts to provide $25 billion in emergency aid for the automakers. But they said the bill would need to be approved first in the Senate, which some Democrats said was highly unlikely. When you get gemons, “make lemonaide” the saying goes. But when spending taxpayer billions for a fiscal and economic recovery plan or “bailout” that almost nobody likes, a lemon can get in the way…. Finally, the outlines of a coherent debate on the federal bailout. This comes as welcome relief from a campaign season that gave us the House Republicans’ know-nothing rejectionism, John McCain‘s mindless railing against “greed and corruption,” and Barack Obama‘s detached enunciation of vacuous bailout “principles” that allowed him to be all things to all people. Now clarity is emerging. The fault line is the auto industry bailout. The Democrats are pushing hard for it. The White House is resisting. Underlying the policy differences is a philosophical divide. The Bush administration sees the $700 billion rescue as an emergency measure to save the financial sector on the grounds that finance is a utility. No government would let the electric companies go under and leave the country without power. By the same token, government must save the financial sector lest credit dry up and strangle the rest of the economy. Treasury Secretary Henry Paulson is willing to stretch the meaning of “bank” by extending protection to such entities as American Express. But fundamentally, he sees government as saving institutions that deal in money, not other stuff. Democrats have a larger canvas, with government intervening in other sectors of the economy to prevent the cascade effect of mass unemployment leading to more mortgage defaults and business failures (as consumer spending plummets), in turn dragging down more businesses and financial institutions, producing more unemployment, etc. — the death spiral of the 1930s. General Motors, Ford, Chrysler and the United Auto Workers union are pouring millions of dollars into a lobbying campaign for a taxpayer bailout. The money devoted to influence peddling in Washington would be better spent on improving quality and finding ways to reduce a bloated cost structure, but both management and UAW have decided that fleecing taxpayers is a better option. A taxpayer bailout would be a terrible mistake. It would subsidize the shoddy management practices of the corporate bureaucrats at General Motors, Ford and Chrysler, and it would reward the intransigent union bosses who have made the synonymous with inflexible and anti-competitive work rules. Perhaps most important, though, is that a bailout would be bad for the long-term health of the American auto industry. It would discriminate against the 113,000 Americans who have highly-coveted jobs building cars for Nissan, BMW and other auto companies that happen to be headquartered in other nations. These companies demonstrate that it is possible to build cars in America and make money. Putting them at a competitive disadvantage with handouts for the U.S.-headquartered companies would be highly unjust. A bailout also would be bad for General Motors, Ford and Chrysler. The so-called Big Three desperately need to fundamentally restructure their practices. More specifically, the car companies need to endure some short-term pain in order to restore long-term viability. But that won’t happen if politicians raid the treasury. Goldman Sachs suspended its rating on General Motors Corp on Thursday and said the automaker needs at least $22 billion in federal aid, while Chrysler said it would be “very difficult to survive” without government support. Chrysler LLC Chief Executive Bob Nardelli said Chrysler was losing money due to a decline in U.S. auto sales to 25-year lows, and said Chrysler would seek federal money for its liquidity and restructuring needs. In one of his few appearances since merger talks between GM and Chrysler broke off, Nardelli said Chrysler must have broader ties with U.S. automakers or alliances with overseas competitors to ride out the industry downturn. The auto industry has stepped up lobbying efforts for government support and the heads of the three U.S.-based automakers are expected to testify next week before a congressional committee considering aid for the industry. The Bush administration said the government could quickly disburse $25 billion in loans already approved by Congress. However, the administration has responded coolly to an aid plan being shaped by Democrats, which includes using part of the $700 billion financial rescue package to provide additional liquidity for the auto industry. U.S. President-elect Barack Obama is considering appointing someone to lead efforts to help the auto industry return to health, an Obama aide said on Thursday. Advocates for the nation’s automakers are warning that the collapse of the Big Three — or even just General Motors — could set off a catastrophic chain reaction in the economy, eliminating up to 3 million jobs and depriving governments of more than $150 billion in tax revenue. Industry supporters are offering such grim predictions as Congress weighs whether to bail out the nation’s largest automakers, which are struggling to survive the steepest economic slide in decades. “We’ve got to do this because the cost of inaction is so high to communities, to workers, to companies,” said Sen. Sherrod Brown, a Democrat from Ohio. He was among many lawmakers worried that an industry collapse would be devastating for everything from school districts to small businesses. Even if just GM collapsed, the failure could bring down the other two companies — and even the U.S. operations of foreign automakers — as parts suppliers run out of money and shut down. Concern about the automakers hit new heights Friday when GM and Ford reported they spent a combined $14.6 billion more than they took in last quarter. GM said it could run out of money by the end of the year. Ford said it could last through 2009, but only because it arranged a hefty credit line last year. All this comes after tight credit and economic uncertainty in October reduced U.S. auto sales to their lowest level in 25 years — with no rebound in sight. If the industry failed, among the hardest-hit communities would be Lordstown, Ohio, a village of 3,600 people about 50 miles east of Cleveland that has been home to a GM factory since 1966. If the plant closed, Lordstown would lose up to 70 percent of its budget, a scary scenario that proponents of a multibillion dollar bailout say would be repeated across the industrial Midwest. You are currently browsing the archives for the General Motors category.